Clean lines rendered in a rustic, earthy pattern. Swirls rich, double finish- smooth and glossy on the inside, ribbed and matte on the outside- sets a striking and original table. The soft rib on the outside of the collection offers a hand made look. Generous serving pieces and unique organic shapes make laying out any meal a treat for host and guest alike. Made of Ironstone with a pin-firing technique which allows the entire bottom of the plate to be glazed including the base. This process significantly reduces water absorption and increases chip resistance. Microwave and dishwasher safe. 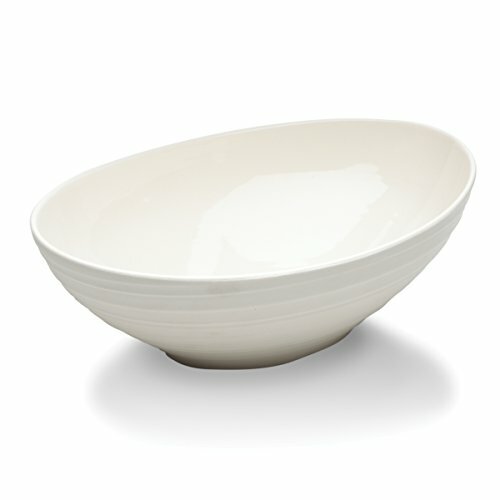 Oval vegetable bowl is 10-1/2 inch long x 7-1/2 inch wide.